IATI initiated today a business seminar intended to bring forth first-hand knowledge on the potential in outsourcing from software & IT companies in the Palestinian authority. One-on-one meetings were also held, with leading MNC R&D centers. 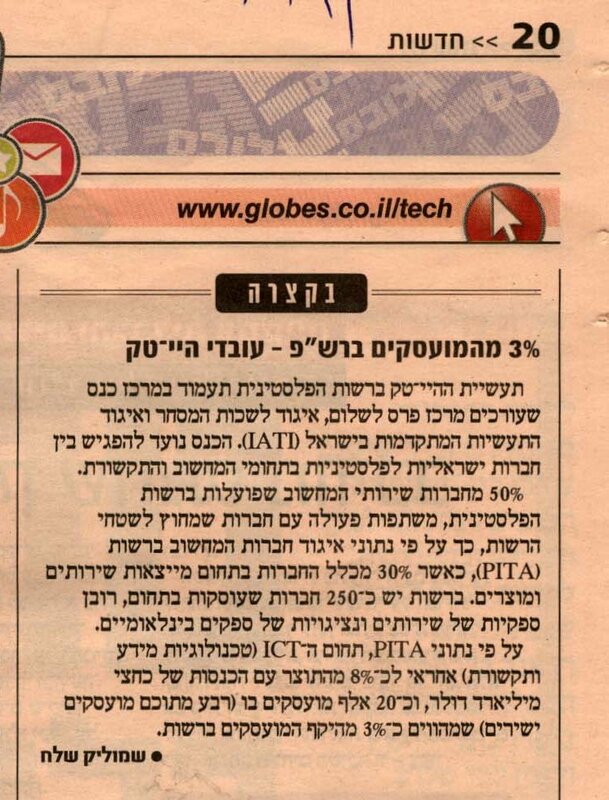 Pitango's Co-Founder and Manager Partner Chemi Peres said: "There is a great opportunity for Palestinians, Israeli Arabs and Israeli entrepreneurs, to co-operate in order to build companies that will serve the huge Arab speaking market in the Middle East. It's a chance for a Middel East of innovation". For the Globes news item about the meeting click here. For the story in The Marker click here. For the Jerusalem Post story click here. For the conference summary in the Jewish Voice click here. For the Resht Beit radio broadcast - an interview with Karin Mayer-Rubinstein, IATI's CEO, about the seminar, cick here. For a UPI sotry click here.